OK. Maybe it wasn’t as dramatic as all that. But the recent rediscovery of the New Bremen Town Musicians, who take their moniker from a Brothers Grimm story, lends itself to flights of fairy-tale fancy. The sextet, last active in Vermont more than a decade ago, was composed of brothers Dan and Willy Lindner — better known as the core of revered local bluegrass band Banjo Dan and the Mid-nite Plowboys — along with their wives, Jaye Lindner and Nancy Mosher, Jaye and Dan’s daughter Deanna Booth, and bassist Matt McGibney. A career retrospective, When Time Was Young, was released last year. Consisting of 24 tracks, both live and culled from various studio sessions, the double-disc album is a blissful glimpse into the past. Even for those who weren’t around to witness the band in its heyday, the CD is unfiltered, sepia-toned nostalgia, harkening back to a seemingly purer time. While the brothers Lindner may carry more name recognition for local fans of folk, bluegrass and old-time, the true stars of this record are the ladies. From the opening track, the Booth-led “Endless Highway,” through the album’s two dozen traditionals and covers, their collective vocal performances are remarkable. On numbers such as the crackling traditional “How Great Thou Art,” Jaye Lindner sounds as though she was recorded through a tin can in an old Southern Baptist church. Nancy Mosher’s sweet, innocent croon is compelling and soothing throughout. The three female vocalists harmonize together with natural, familial ease. That’s not to say the gentlemen are completely outdone. With fine turns on lead, both Dan (especially on “No Hiding Place Down Here”) and Willy (“Defying Gravity”) Lindner reveal why they’re considered local treasures. And those moments when the sextet puts all hands on deck — as on Harlan Howard’s “The Grass Is Greener in the Mountains” — are prime examples of why family bands are so special and timeless. 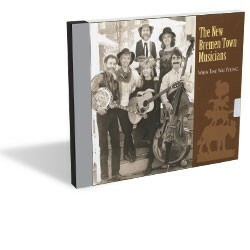 When Time Was Young by the New Bremen Town Musicians is available at banjodan.com.